Jolly Ranchers, one of my all-time favorite candies, has a long tradition of spewing out new varieties of their candies. And generally speaking, …they’re not good. From “double blasts” to flat lollipops to chewy things, they just never was a good as the old fashioned JR sticks or bits (the small bite sized thingies). Enter the new Jolly Rancher Lollipops. 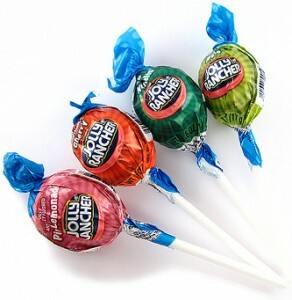 Don’t confuse these with their new Jolly Rancher CHEWY filled Lollipops- these aren’t them. I haven’t tried the chewy ones yet, but I will soon. For now, though; JR Lollipops, in 4 yummy flavors: green apple, cherry, watermelon, and my fave, pink lemonade. This might be the easiest review I’ve ever written, cause here’s the deal: they simply ARE the exact same candy as the sticks & bits, but in a round lollipop. Why is this good? As Guru Matty pointed out to me, it rocks because, once the juicymouth® explosion gets going (and it DOES get going), it’s nice to be able to easily pull the thing out of your mouth for a spell. Of course, that can be done with the classic sticks, but not with this bits. Regardless, having a stick makes it very convenient. The flavors, as I said, are the same as their classic candies, so if you like them, you’ll like these. I wish they had included my 2 favorite JR flavors (grape and lemon), but I know that I’m in the minority with regards to this, as it’s ALWYAS the grape ones left in the mixed bag after people get their hands on them (much to my delight), and I’m not sure that the lemon are even mass produced anymore. Anyhow, these rock. Only 60 calories a pop (for you Weight Watchers folk out there, that’s one point) and truly delicious. Bottom Line: Hells yes. Yummy, mouth watering, and reminiscent of the old school faves. Work it.